Q-Snap. 11 1/2 Clamps Pair for 14 Extension Frame  - $3.64 : Yarn Tree, Your wholesale source for cross stitch supplies. Item 7813. Two 11 1/2" Replacement Clamps for 14" Extension Frame Sides. [original item SF CP9]. Replacement clamps hold the fabric onto the Q-Snap frame. 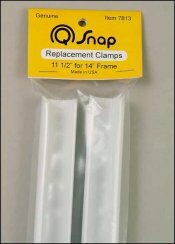 For use with the 14" Q-Snap extension frame (Item 7735). Two clamps per package.